1996 Hallmark Happy Holiday Barbie Keepsake Ornament, No. 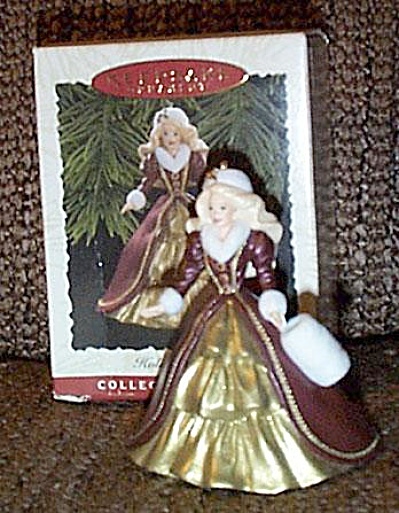 2761, is an ornament version of the 1996 blonde Happy Holiday Barbie doll. She is wearing a long burgundy with gold accents formal evening gown, a white muff and a white decorated hat. Lower priced insured First Class Mail shipping is available by request in the comments section of the order form, and the rate will be adjusted. New, and mint-in-the-box old stock.